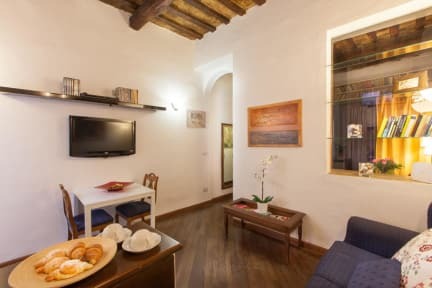 Trastevere Apartment kohteessa Rooma, Italia: Varaa nyt! 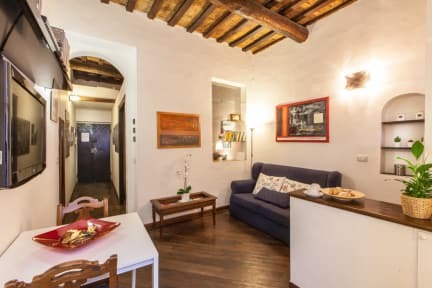 The apartment 'Trastevere' is an apartment on the second floor (no elevator) of a building mid-nineteenth century and is located in the heart of Trastevere area of Rome's most famous for its nightlife. The apartment consists of one bedroom (king size bed) with wardrobe, bedside table and desk. The dining area is at the table for two people, there is a sofa, coffee table, a 32 'LCD TV, a DVD and a small but functional kitchenette with fridge / freezer and electric stove with two plates, we also have in this room a A.C., and winter is also used for heating, bathroom with shower without bidet. We request to all our customers a deposit of 100 the day you arrive as security deposit against any damage that might be caused to the apartment.